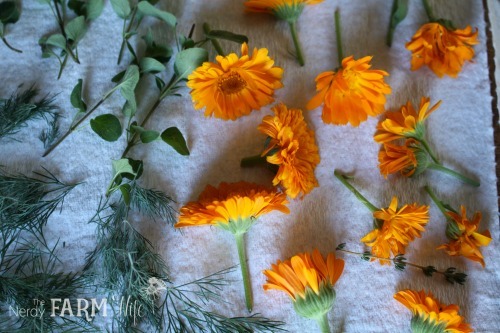 This week on the blog, I’m sharing ways that you can use calendula. By letting the flowers infuse in oil, we’re able to extract many of those properties and incorporate them into easy-to-use products such as: salve, lip balm, soap, cream and lotion recipes. For ear mites in pets, place a few drops in their ear. Gently massage the area to work it in a bit, if they’ll let you. Now that you know some ways to use it, let’s make this wonderful oil! We want to use dried flowers for this. While you can use fresh herbs to make infused oils, the higher water content greatly increase your chances of spoilage when doing so. If you raise your own flowers, just spread them out in a single layer on a paper towel or brown paper bag in a place they won’t be disturbed. Turn them over every day or so and let them air dry for a week or two. If you don’t have access to fresh, you can buy some online. I like to buy most of my dried herbs at Mountain Rose Herbs (affiliate link), but your local health store might be able to supply you with some as well. Fill a jar about one-fourth to one-half full with dried calendula flowers and pour olive or some other light oil (like sunflower or sweet almond oil) over them. Fill the jar almost to the top. Cap and store in a cool, dark place for four to six weeks, shaking periodically, then strain and use. You can infuse your oil, in a quicker manner, by setting the uncovered jar of oil and flowers gently into a pan of water set over a medium-low burner. Heat slowly for a few hours, then remove the pan from the heat source. You can then use it right away, or for better results, let it infuse several days longer in a dark cabinet. To make a double infused (and more powerful) oil, take your freshly strained oil and repeat the process with a new batch of dried flowers. Now, we’re ready to make our salve! This salve is perfect to have on hand in your emergency kit since it will cover almost any minor skin ailment that a person or animal could experience. Add the oil and beeswax into a heat proof container. Set it gently into a pan containing several inches of water. Bring the temperature up to medium-lowish heat and let the container stay in the makeshift double boiler until the wax is melted. 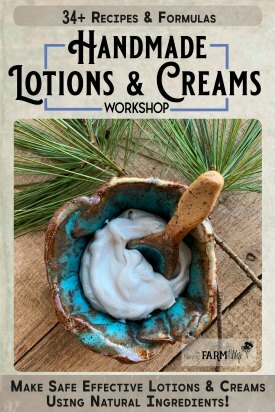 If you’d like to make a pretty label for your salve, check out my tutorial on making round labels. Tagged calendula, salve. Bookmark the permalink. Exquisite photos, Jan! And, as always, good information too. Great info! 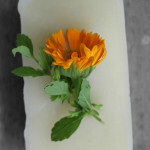 Recently used a calendula bar of soap from a home soapmaker and it was great for dry skin and smelled wonderful. With your posting, now I’m interested in growing and using calendula. Thank you for your time and research and sharing your goodies. Always enjoy reading your blog and learning new things. Hi Mimi! “Golden treasure” is a perfect name for this wonderful flower. :) I’m so glad that you are enjoying the blog! Beautiful pictures and information! I just render some nice beeswax can’t wait to try this recipe. So glad I found your blog! Hello, will calendula oil from herb7pharm work ? Can you substitute beeswax pastilles with just beeswax? Hi Liz, Yes, they are the same thing. Just the pastilles are in an easier to use form. Is there anywhere I can buy double-infused calendula oil? I found a place that offers a double infused oil. I’ve no personal experience with them, but I like how they sound! I’ve tried the calendula oil from Mountain Rose Herbs before and thought it had a nice potency – though it appears to be a single infusion. Mountain Rose’s version is 4 oz for $13.50 where Garden of Wisdom is 8 oz for $24.30, so GOW seems fairly on target as far as pricing. I can also emphatically state that although I love the quality of Mountain Rose Herbs, they have incredibly slow shipping & processing times, so if you are only in the states for 3 weeks, that may be a relevant issue. 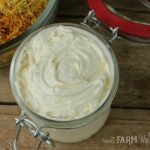 How long is the shelf-life on the calendula salve & violet leaf balm? How can you tell if it goes bad? Thank you – I’m glad you like it! :) Shelf life should be about a year, if stored where it won’t get too hot. (i.e. Your car’s glovebox is a bad place to keep it.) You can add vitamin E to your salves (after the oils melt, but before pouring) and/or rosemary antioxidants to extend the shelf life further. To tell if it’s gone off, just give it a sniff. It will start to smell like rancid oil. I love your post. May I know how much Vitamin E and/ or rosemary antioxidants to add to extend shelf life. Hi Kelly! I usually do a little splash, if using rosemary antioxidants. That would probably translate to about 1/8 to 1/4 teaspoon, or approximately 10 to 20 drops. I rarely use vitamin E because I have a relative allergic to most brands, but when I do, I add the contents of one gel capsule to a batch of salve or lip balm. Sometimes two capsules, if they’re small. In these types of crafts, precision isn’t as vital as it would be in something like soap making. How fresh your ingredients are is important for shelf life as well – if you start with a high quality oil, that will help a lot. You can also refrigerate your oils to make them last longer. Salves are generally very stable though and will last a long time, even without any preservative additions. Your salve looks very nice and smooth. Any idea why my salve has spots on it after it hardened up, like it didn’t firm evenly. I tried reheating the salve, but it still has spots on it. Any idea why it does that? Hello there! Curious what happened with the spots in the salve? I had the same issue. Hi Deborah! Were you pouring into a jar or a tin? Sometimes, if you pour in a jar, it gets a sinkhole in it as it cools. To fix that, you can let the melted salve cool slightly before pouring and then only fill the jar about 1/2 to 3/4 of the way. Set the rest of the salve back in the pot of water to stay warm. Once the salve in the jar firms up somewhat (about 10 minutes or so), you can pour the rest of the salve on top. That usually helps give a smoother surface. You can also use a heat gun to smooth out the tops of salves & lip balms. If you were using a tin – were the spots very faint and just more like discolorations? That happened to me a few times, but I’ve yet to figure out why! Since it can evened out a bit with the heat gun, it may have something to do with temperature when pouring. Hi Dionne! I use the folksy method of infusing oils and don’t follow exact measurements. I fill a mason jar about 1/4 to 1/2 full of dried calendula flowers and top it off with oil. If I have a lot of flowers, I use a larger jar; if I only have a few, I use a smaller jar. 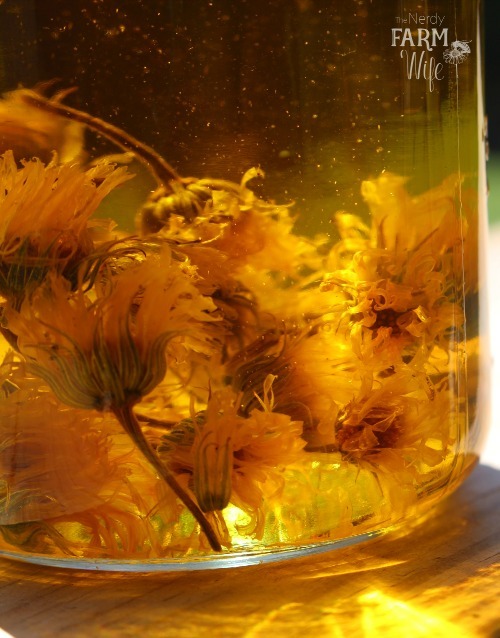 Once it’s done infusing and been strained, you can pour that calendula oil over a fresh batch of dried flowers to make a stronger, more effective, double infusion. Great…. it is safe for children. It is wonderfully gentle and powerful. If I am dealing with a skin issue, calendula is one of my go-to herbs. I found something which I think is calendula but U have searched for images that might relate to it all over the internet and I haven’t found anything. Is there a specific way to identify them? Hi Alexa! Your best bet is to find a local garden or plant expert who can physically examine the flower to be sure. Try checking with garden centers or your local extension agent. Thanks for the info. I harvested and dried some calendula that I grew for my first time and was wondering if you have tried infusing it in coconut oil…do you have a preferred oil that stays fresh the longest and is still effective to use on skin. Also, can I use beeswax from sheets that can sometimes be used to make candles? Trying to use what I have on hand, but not opposed to maybe buying some almond oil and another source of beeswax. Hi Janie, Yes, calendula is wonderful when infused in coconut oil! I’m not 100% sure about the premade beeswax sheets. I know you can make homemade sheets using pure wax & soaked plywood, but haven’t bought any to compare the difference. As long as it’s pure beeswax though, I would think it would work, but double check with the manufacturer to be sure no skin-unfriendly additives are in it. I was just wondering if this is cloth diaper friendly for diaper rash? Thank you! Hi Natalie! I’m afraid I haven’t tested it with cloth diapers to know for sure. I just did a quick search of diaper safe creams and notice that they seem to use candelilla wax instead of beeswax. Otherwise, the recipe should be okay. You can buy candelilla wax at brambleberry.com and to substitute in recipes, just use half as much as beeswax called for. (So, if a recipe calls for 1 oz beeswax, use 1/2 ounce candelilla wax instead.) I hope that helps! Last year my calendula seeds didn’t sprout – can you tell me which brand you have had the best luck with? Hi Colleen! I buy all of my calendula seeds from Baker Creek Heirloom Seeds – they’re wonderful quality and I’ve never had trouble with anything I bought from them. Their site is rareseeds.com. I’m glad you liked the tutorial! Hi Lisa! After you strain flower petals from the infusing oil, they’re usually a bedraggled looking mess, so wouldn’t easily sprinkle on like dry petals. However, I can’t say that I’ve ever tried to let them dry back out and see what happens to their appearance. It’s possible they can be reused in that way, so it’s worth an experiment to see! Good luck with your soap making lesson! Hi there! Greetings from Malaysia. I don’t have dried calendula to make calendula infused oil but I managed to get calendula oil from a local supplier. Will it be as good? I’m due in about 2 weeks time so I hope I would be able to make some before the baby arrives. Some recipes recommend using essential oil as some oils are said to be safe to be used on babies. What say you? i would like to know if making homemade balm would require a safety assessment , to allow me to give to friends and family . Would Sweet Almond Oil work for the oil instead of olive? Last time i placed a bulk order they mistakenly sent 4 gallons of almond instead of 16 oz. and I am looking for ideas to use it up! Would the sweet almond work in any salve recipe instead of olive? Hi Felicia! That is a lot of almond oil to use up! I’ve heard of people that prefer sweet almond oil in their salves, so I think it would make a wonderful substitute in any salve recipe. I apologize if this question has already been asked. I saw where you can add Vit. E or Rosemary antioxidants (btw, what is that?) to extend the shelf life of the salve. How long, though, does the infused oil last? Should it be refrigerated? I have some I made and was ready to use in December. I haven’t used all of it and just now took the lid off to smell…and it smells like Olive oil. Is it okay? Should I start a new batch to infuse? Hi Joy! The shelf life of infused oil will depend on a lot of things, such as: how old the olive oil was when you bought it (older oil will go rancid more quickly), how long you had the olive oil before using it & how it was stored (heat and light will speed up rancidity). I don’t refrigerate my oils and rarely add vitamin E and they still are good for at least a year. As long as your oil smells fresh (or just like oil should smell) and not rancid or old, then it should be good to use! Your batch from December should be fine. More on rosemary antioxidants here: https://www.mountainroseherbs.com/products/rosemary-antioxidant/profile but basically it’s used for the same purpose as Vitamin E to prevent (or postpone) oxidation of oils. 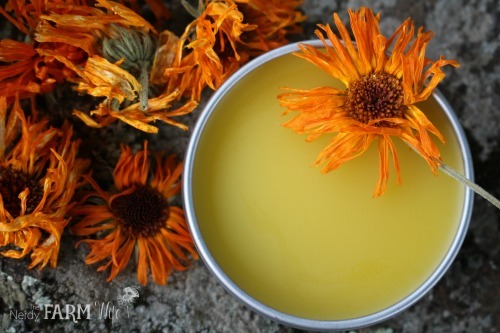 I made another batch of calendula balm today. I also made two batches of soap today(the first batch with honey, colorant and e.o., the second, without). All of my infused oil is now used up. I made up new jars of o.o. and calendula today. I have two pots left from the first batch, which was a double-batch, at least. I sold eight of them. :-) My one-ounce tins would not hold an ounce of the balm…only .7 ounce. Was wondering if your two ounce tins actually held two ounces or less, like my one ounce tins. That’s wonderful that you’ve sold some of your creations! :) I do believe that the measurements of tins are done as volume instead of weight, since I run into the same problem, with the two oz tins as well. Thank you for sharing your recipes. Im so glad to have found your website. My 11 month old baby has itchy scalp and sometimes flaky. It doesnt look like cradle cap, more like dandruff / seborrheic dermatitis. I was wondering if I can use calendula infused oil mix with coconut oil to rub on his scalp. Or making the salve to rub on his scalp. Will that relief the itchiness? Another idea is to use a gentle, bathwater-temperature calendula tea as a hair rinse during his bath. I hope that calendula is able to offer your baby some relief! He Melanie, I’m so happy that you liked the mint ebook! :) For calendula, you can use either the petals or the whole flower. I hope you enjoy your salve! https://thenerdyfarmwife.com/newsletter/ Thanks & have a wonderful day! Hi Stephanie! You sure can combine the two together – I do that quite often myself! It will work great for salves. I have both Endometriosis and Adenomyosis which is (to a degree) under control with hormone treatments but I want to kick the pain completely. What is better for this – the calendula oil or cream? Also, is there a specific brand you recommend and is there anything else herbally that I can try while I’m at it? Even though it’s mostly on fertility, it will have some overlapping information that should be helpful to you as well. I do hope you’re able to find some relief of that final bit of pain! I had a loved one that suffered from endometriosis and I know it makes life quite difficult! Thank you! I just love your site and recipes. Learning a lot from you! What’s the best hardness/softness for a salve? Able to easily make an indent with a finger? I know it shouldn’t be this difficult. Thank you so much for your help! 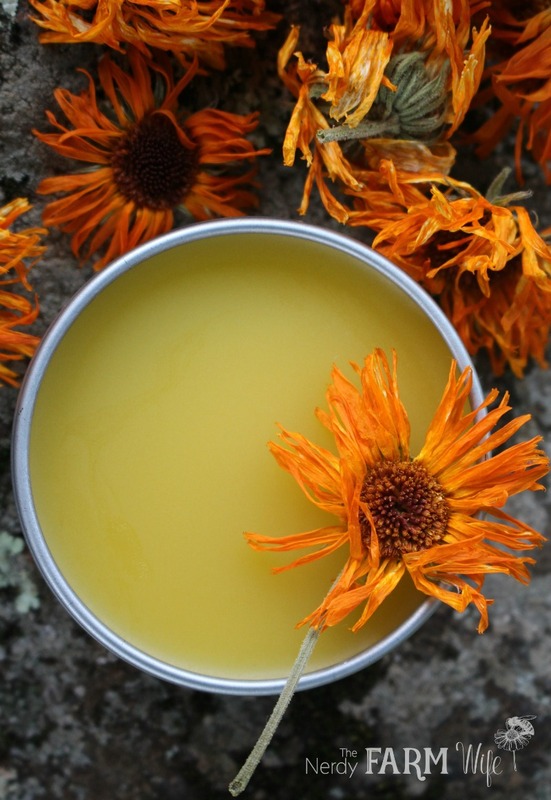 can Calendula healing salve be used on an infant with a yeast infection? Hi Stephanie! You could do a test patch and see if it would help. (If you’re making your own homemade salves, I would completely avoid adding any essential oil to a product intended for an infant.) Another idea is a calendula tea wash and lots of fresh air to the area. If none of the home remedies are working, your pediatrician should have some helpful advice. I hope that your baby feels better soon! You are so awesome! :) Every time I read something of yours I get questions answered and amazing information! Thank you for sharing your wisdom! would it be ok to just leave out the beeswax? for vegan purposes? i heard i can use candelilla wax?? its the same price but only less than half should be used more or less. would love your opinion on this. im a newbie to all this! thanks! Hi Vanessa! You sure can use candelilla wax instead. I usually use a little over half as much candelilla, as I would for beeswax. So, say a recipe calls for 10 grams of beeswax, you might would use around 6 grams or so of candelilla. You’ll probably have to experiment to get the right consistency. Just melt down your salve if it doesn’t turn out quite like you’d like and add more oil (if it’s too firm) or candelilla wax (if it’s too soft). One thing I’ve found about candelilla wax is that it sometimes has a faintly unpleasant smell (probably depends on vendor), so I always add a bit of extra essential oil, like lavender, to mask the scent. Hi, can i add a dried calendula to the salve before pouring into the jar for decorative purpose? Is it going to contaminate the salve? Hi Esther! I’ve seen people do that for decoration and it does look pretty. It would probably be okay if you used a single, completely dried flower right on the top, so it can be removed by the end-user easily. From a practical standpoint, you just don’t want petals or flowers mixed throughout because it would make the salve more difficult to use. I infused calendula 2 years ago, will it still be good to use? Hi Sara, Sorry I missed this question earlier! Sometimes a bunch comes in at once and I miss some in the process! Two years is a pretty long time. Does the oil still smell fresh or does it smell like oil oil or rancid? I would tend to want to throw out oil that old, but if it’s something like jojoba oil with a long shelf life, then it might still be good. Good luck! I hope you find some relief for your little guy! Can you please tell me if the oil and beeswax are measured in weight or volume when making this salve recipe? Thank you. Hi Lisa! The beeswax is measured by weight. Would it be okay to use coconut oil instead of olive? Hi Heather! Yes, you sure can use coconut oil in salves, instead of olive oil. In cold weather or climates it may make the salve a tad bit harder, so you may want to use a smidge less beeswax in the recipe. If it turns out too soft, you can always remelt it and add a little more wax if needed. Hello Jan! I was wondering – how do you infuse with coconut oil if it solidifies in cooler temps? Do you keep it to the stove top method? Also, can canola oil be used in any of your infusions? Or is olive, almond, avocado (etc) the better choice? Thanks and love receiving your newsletters! Just received your book as an early birthday present and am very excited to read! Take care and be well! Hi Melanie! Happy Birthday and I hope you enjoy your book! :) I usually use the stove top method for infusing coconut oil. If you have a warm sunny window, you can leave it there too for several days to a week. It might solidify at night and melt during the day, but it seems to infuse really well that way too. As far as I know, canola doesn’t have any particular benefits for the skin, so I don’t really use it. It won’t hurt your skin or anything, it just won’t give the extra benefits of something like sunflower or almond oil. Thanks for the info and the website! I’ll give the window a try as it’s been quite warm here throughout the day. Take care! Hi! 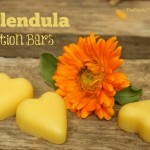 What is the stove top method for infusing calendula in coconut oil? Hi Lily! You would infuse it just like you would a liquid oil such as olive. Set the uncovered jar of oil and flowers into a pan of water and place it over a medium-low burner. Heat slowly for a few hours, then remove the pan from the heat source. This time of year when it’s really warm outside (over 76 degrees F, melting point of coconut oil, in the shade), I infuse coconut oil outdoors either in a shady spot or under a cardboard box so the sun won’t fade the colors. In that case, I keep the jar loosely covered so no stray bug lands in there! First of all, thank you for posting so many lovely recipes. One of the first salves I made many years ago (before I started experimenting :) was based on your recipe. I hope your business thrives and that you are blessed for the time and effort put into these! Secondly, I would like to support you by purchasing my herbs through your link; however, Mountain Rose Herbs is sold out of calendula flowers. Could you recommend another source & give instructions on how to get your credit for the recommendation? She is also the editor of Green Talk & a wonderful small business to support. Her herbs are grown organically & treated with the utmost care. Everything I’ve purchased from there has been top notch! I’ve read somewhere about solar infusion, but yours said to keep the oil in the dark place (which is actually my preference since I’m afraid the sun will have negative effects on the infusing oil!). Will these two methods have noticeable different results? Which one is better for eczema, calendula or rose petal salve? Sorry for asking too many questions! I’m only a very curious beginner ;D Thank you so much for your time and I hope my English is not bad… (I’m from Asia). Hi Yolanda! So happy that you like the recipe! Those are great questions. All questions are welcome & your English is flawless! :) A double-infused calendula oil is richer, but that’s a good thing. You can’t really make a calendula-infused oil that’s too strong. I most often infuse in a dark place, but do sometimes use a solar infusion. I don’t like to infuse in the sun for *too* long though, since it can fade the herbs & in my mind, faded herbs = faded potency. It’s kind of a personal preference thing though, so whichever way makes your happiest, is the way to do it! For eczema, I’d try calendula salve first. Hi! I infused calendula in olive oil pomace…would that work? And for your recipe how much essential oil could i add? Thanks! I just made some calendula oil with my own flowers. I was told to just set the jar in a warm sunny place and shake every day. It is contrary to your advice, Which one should I do? This is a 1st for me so I wanna get it right. Hi Linda! There are several different ways to infuse oils and everyone has their own favorite method. Setting the jar in a warm sunny place and shaking each day will work too, so you can choose either way you like best. :) It’s really hard to mess up an infused oil as long as you start with dried flowers so I think yours will turn out great! 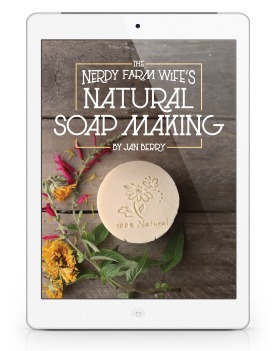 Just bought your book Simple & Natural Soapmaking. Was disappointed not to see this recipe in it, but whatever. I printed it. Thank you for all your info. BTW, I posted my website but it is under construction with iPage, so if you try to look at it you will get an under construction sign. Have a great day. Life is beautiful! Hi Phyllis! The Simple & Natural Soapmaking book only has soap recipes in it, but I do have another print book with salves, lip balms, body butters & more! It’s called 101 Easy Homemade Products for Your Skin, Health & Home. I try to keep the projects on my site somewhat different than the projects in my books so that way it doesn’t feel like you’re buying a repeat of my website. :) I like the name of your new site & I wish you lots of success with it!